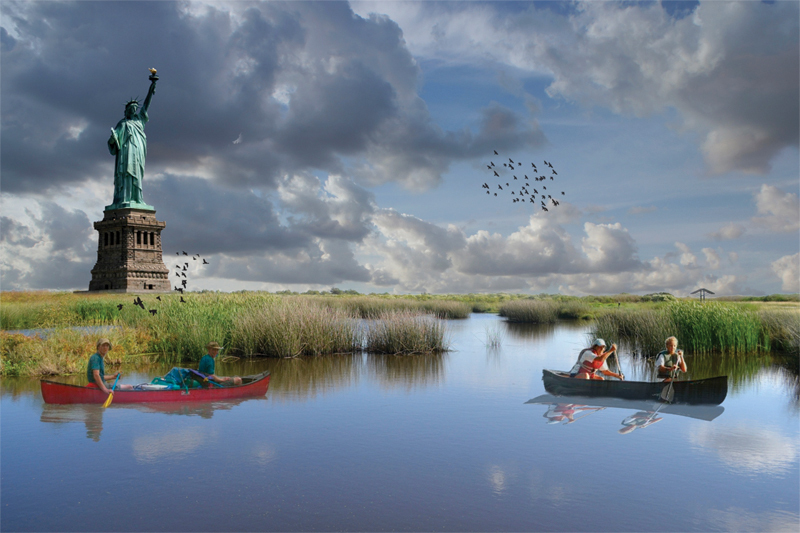 This photomontage of the Statue of Liberty in Galveston Bay by Thomas Colbert illustrates the importance of making the bay a place for all. Image by Thomas Colbert. 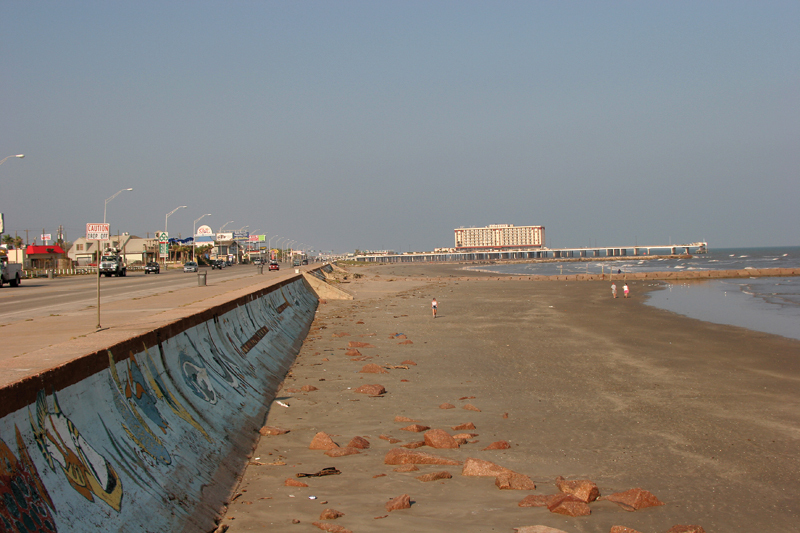 The Galveston Seawall, built following the Great Hurricane of 1900, rises 17 ft. above sea level. It was overtopped by Hurricane Ike in 2008. Photo by Bob McMillan/FEMA. 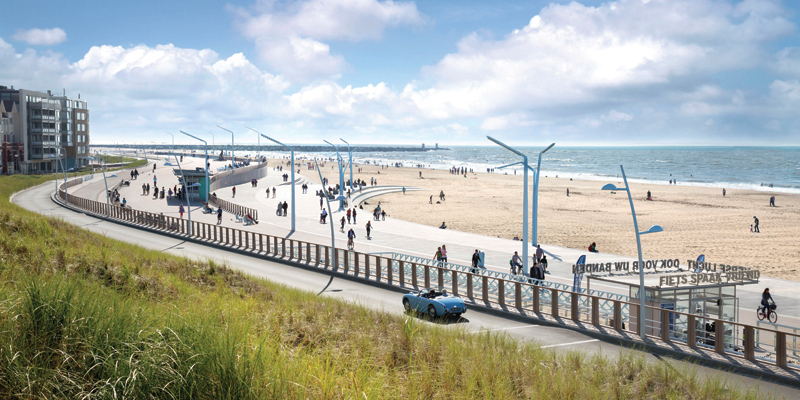 The Scheveningen Boulevard Coastal Barrier in The Netherlands, designed by the late Manuel de Solà-Morales. Photo by Gerrit Schreurs Photography. “Usually, the cost of doing nothing is missing out on some future benefit,” Blackburn says. “In this case, the cost of doing nothing is disaster.” Much of the research and many proposals for the Houston-Galveston Area were prompted by Hurricane Ike, which hit on September 13, 2008, and was a Category 2 storm in terms of wind, with surge levels more like those of a larger storm. Damages, which cost $25 billion, came not only from the surge but from the water flowing back in from the bay side. The Port of Houston’s website lists the Houston Ship Channel as 2nd in the nation in overall tonnage; 1st in U.S. imports and U.S. export tonnage; and handling 41 percent of project cargo at Gulf Coast ports. The port is also the home of the nation’s largest petrochemical complex, the second largest in the world. Estimates indicate that if a storm surge overwhelmed the complex, the spill volume could range from 2.9 million gallons at 10 feet of water to 289.7 million gallons at 30 feet of water. For a major surge event, FEDERAP (Facility Economic Damage and Environmental Release Assessment Planning) models estimate a baseline condition of $37–73 billion dollars just for flood damage to the industrial facility, not including cleanup or lost production costs for the economies. Such an event would have a substantial impact on a local, regional, national, and international scale. Considering the risk of a disaster in the bay without any action, it is equally important to understand what a proposal for the bay could produce for the community. One new option for the mid-bay strategy begins to fulfill some of Colbert’s early hopes. 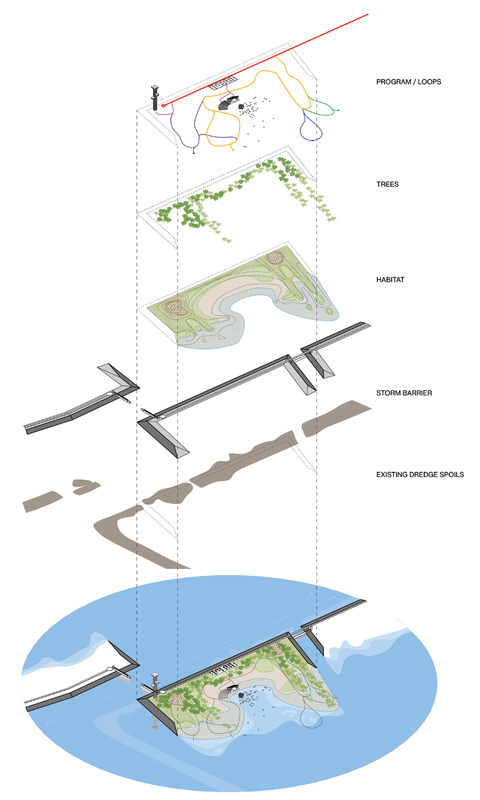 Designed by Rogers Partners Architects+Urban Designers of New York and Houston, the strategy, developed as part of the Houston-Galveston Area Protection System (HGAPS), asks what else a protection system can do, how it can function for a community during the 99 percent of the time when there is no storm surge. Firm principal Rob Rogers, FAIA, a Rice graduate, has regional as well as national urban design experience. Rogers Partners’ design for the mid-bay strategy, like much of their work, is, says Rogers, “focused on the intersection of landscape, architecture, and urbanism.” The firm’s design for the new St. Pete Pier in St. Petersburg, Florida, establishes connections between the public and nature, commerce and transit. To promote security post 9/11, for the New York Stock Exchange Streetscapes, instead of putting up standard bollards, Rogers Partners created a barrier that doubles as a pedestrian amenity. When Charles Penland, a senior principal at Walter P. Moore — who also participates on SSPEED at Rice, the board of the Houston Water Authority, and the Environmental Committee of EWRI — reached out about the project, intriguing opportunities already existed in the infrastructure and at dredging sites. “Can we create a barrier that improves the habitats, water quality, and wetlands while providing a net benefit and value for the bay?” he remembers asking early in the process. 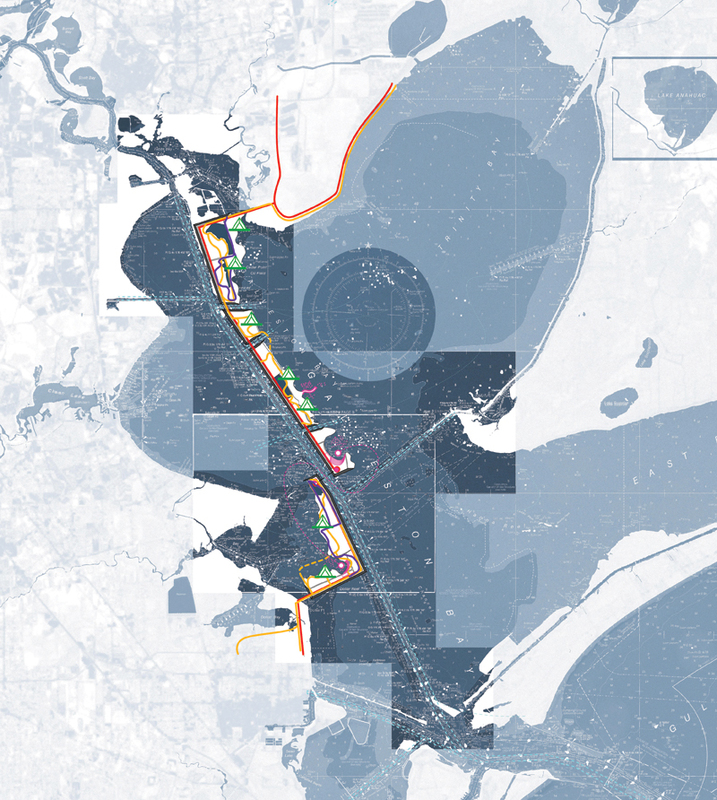 Rogers Partners’ proposal has its roots in the work not only of SSPEED, but also of Texas A&M University at Galveston (TAMUG), the Gulf Coast Community Protection and Recovery District, the Texas General Land Office, and the U.S. Army Corps of Engineers. As William J. Merrell, president of TAMUG, states in his research, there are two strategies for dealing with vulnerability to storm surge: First, limit or reduce human infrastructure, and second, build and maintain comprehensive coastal defenses. Nonstructural strategies seek to minimize risk on the residential side by means of disclosures, with signs in the community, warnings to prospective property-buyers, and real-time flood information that can help with evacuation. Others have focused on policy: With flood insurance subsidized through the National Flood Insurance Program, building in vulnerable areas has been incentivized. The Biggert-Waters Flood Insurance Reform Act of 2012 would phase out these subsidies for homes below 100-year flood elevation levels, reducing risks to the taxpayers outside the flood-prone areas who pay for the subsidies, but making selling flood-prone homes — or choosing to pay the unsubsidized insurance rates — difficult for current owners of these homes. A solution is offering one-time buyouts to owners of flood-challenged homes. While the foregoing addresses residential concerns, another nonstructural proposal is to tap the recreational potential of the bay, by creating the Lone Star Coastal National Recreation Area (LSCNRA). LSCNRA would bring more recognition to the upper Texas Coast, since National Recreation Areas are part of the National Park System, but would be a relatively hands-off solution, as participation by property owners would be voluntary. Since Hurricane Ike, the two most prominent studies, initially, were the Centennial Gate, originally developed by SSPEED, and the Ike Dike, developed at TAMUG by Merrell. The Centennial Gate focuses on protecting the Houston Ship Channel and petrochemical complexes, and connects with the Texas City Levee by either elevating State Highway 146 or constructing a levee along the shoreline of Galveston Bay. In the early stages, plans by the SSPEED Center also proposed a Galveston Island Levee as a back-side barrier, to prevent water from rising and going into the city — something which the Ike Dike alone would not address. The Ike Dike is a coastal spine for the bay, and includes a storm surge barrier at Bolivar Roads, the largest opening into the bay. TU Delft (Delft University of Technology, in the Netherlands) and TAMUG have collaborated on this proposal, with the Bolivar Roads barrier to include a navigational channel and an environmental section. Studies from Delft, like that of Maarten Ruijs, have simulated the hydronics of different alternatives for Bolivar Roads, San Luis Pass, and Rollover Pass, while Peter A.L. de Vries investigated the environmental section and Iman Karimi examined the navigational barrier. Other studies have sketched design approaches for integrating the barrier island levee, with its “levee in dune” and raised highway approach for the coastal spine. Three possibilities came out of the initial studies: the Upper Bay Strategy (Centennial Gate), the Mid Bay Strategy, and the Lower Bay Strategy (Ike Dike). The price tag for each plan ranges from $2.84 billion for the upper-bay gate, to $2.76 billion for the mid-bay gate, and $7.62 billion for the lower-bay gate — prices that are dwarfed by the cost of disaster. While they may seem like separate plans, they are in fact all interrelated, and share several components: dredge spoils, raised Highway 87, raised FM 3005, and the Galveston Levee. Diagrams highlight the different components, as well as existing protections that could be heightened or expanded, like the Texas City Levee, Freeport Levee, and the Galveston Seawall. Some components, such as raising the highways and existing levees, do not require any impact or environmental study and, given a build height and funding, work could begin on them tomorrow. Most importantly, as Penland, Blackburn, and SSPEED’s 2016 report suggest, multiple lines of defense constitute the best strategy, particularly as climate change continues to increase the elevation of sea level. So, addressing the components common to all the plans and pursuing all strategies — including the Mid Bay Strategy (through regional funding), and simultaneously applying for the federal funding for the Lower Bay Strategy (a notoriously long process but necessary, given the larger price tag) — appears to be the best way to minimize risk. The Mid Bay Strategy is what Rogers Partners has begun to explore through a series of renderings. While many of the studies by SSPEED have addressed cost and engineering issues, the need for a vision to build off these functional components is apparent. Built in an area where disposed dredge material is contained, the space would plug into these dredge sites, transforming the area into a place for enjoying the natural landscape. Since much of the area is already disturbed by these dredged sites, additional environmental impacts could be minimized, and water and sediment quality improved, by the way the system is designed — in short, the system could be a catalyst for positive effects on the ecology. In addition, by working with the dredging sites already underway, efforts could plug into an already existing system, reducing costs of implementation. Going beyond the functional is at the heart of Rogers Partners’ proposal. Blackburn points out that the public could experience newfound access to the waterfront itself, since currently much of the property adjoining the bay is privately owned. Residents could find amenities to enjoy as part of a new programmatic narrative, including a series of trails for recreation space, a marina, performance space, fishing camps, and camping spaces. Birding would become an accessible, immersive experience from inside the bay, while picnickers could watch boats moving in and out of the channel. What is proposed would not be just a public protection system, but also a new place that would expand the outdoor offerings of the area. The components would become a larger system that would be a new type of place: habitat as amenity, as described by Tyler Swanson an associate partner at Rogers Partners. While much of it would be public, spaces could be leased to private entities for concessions or other community needs, which could help generate the revenue needed to maintain the area, according to Penland. The protection system would become an asset, rather than just a risk-mitigation drain on funds. Unlike a levee built along the shoreline, this proposal would allow residents views unblemished by the newly created urban space. The landmass would subtly blend, dwarfed sectionally by the size of the boats. Residents could take their own boats out to the new man-made archipelago, enjoying a walk from inside the bay alongside visitors. To understand the inspiration for these proposed improvements, look at the Netherlands’ effort to make protection systems part of the Dutch Delta Works. Look at The Hague’s new reinforced boulevard, Scheveningen, designed by Manuel de Solà-Morales, which integrates panoramic views, green spaces, beaches, benches, and resort amenities. Look at Maeslantkering, the iconic moveable storm surge barrier that includes a museum and education center as well as a kids’ playground. Galveston’s Seawall stands in stark contrast to these testaments to tourism and education of the public. Well-intentioned intervention doesn’t always work, however. The Dutch learned from a dam they built in 1975 — and eventually abandoned — between Ijsselmeer and Markermeer. Feargus O’Sullivan, London-based contributing writer to CityLab, described the resulting ecosystem disruptions as an environmental mess. It is surely important to avoid drastically altering the tidal prism. This is what makes the Mid Bay Strategy exciting: It seeks to use the existing infrastructures and minimize additional impact, while offering a uniquely Houston-Galveston region experience. It also suggests ways that it could be funded: changes to roadways paid with transportation money; work on the areas of the mid bay dredging to be combined with dredging operations; and bond issues as necessary to fund the project for the gate and cover some initial investment, the cost of which might be offset by reduced insurance costs. The Houston-Galveston area has proved the value of urbanism, green, and community spaces, particularly in recent years with projects like Discovery Green and METRORail. The main port entrance can become another stage for the community to showcase itself to those who visit. Last, but not least: To date, the Houston-Galveston area has not needed to be reactive, unlike New Orleans, where necessity has required building more mundane protections quickly. As all three strategies for Galveston Bay are pushed forward, each should look to engage and realize its reach, touching the lives of people directly. As Rogers Partners suggests, viability comes from finding multiple purposes, by encouraging learning and thinking about the performance of a given space. Their proposal is both joyful and hopeful in the way it shapes an exciting future for Galveston Bay. This opportunity to be proactive is one that the region should take advantage of before the next disaster strikes. Renee Reder works for Metalab in Houston.